Alive Supports VS2017 only. Had minimal testing, apologies if it causes VS to crash! 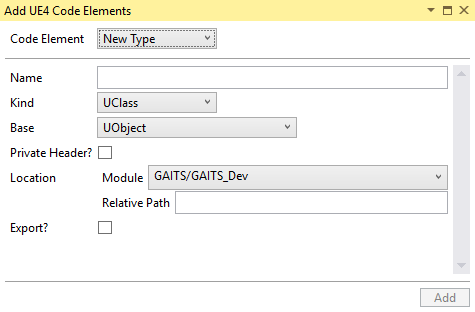 Visual Studio extension with functionality to assist with UE4 project development. Requires Visual Studio 2017. UE4-specific code templates. Generate skeleton code for UE4 classes. Also provides support for adding code modules and plugins from with VS, with associated boilerplate automatically generated. Blueprint property visualizer. Though it's rarely necessary to query the value of a variable declared in blueprint from C++, sometimes during debugging it can be very helpful to be able to check. This extension uses the UE4 reflection system to expose blueprint properties through the Visual Studio watch windows when examining a UObject-derived variable. Code element templates can be accessed through a tool window via View|Other Windows|UE4 Code Elements, default shortcut Ctrl+Shift+=. There is also a 'KantanUE4VS' toolbar with direct access to each type of template (If anyone wants to contribute some simple icons, please let me know). Blueprint property visualization should be enabled automatically, you just need to be examining a variable that points to an instance of a blueprint class, and you should see the [BP Properties] entry at the bottom of the list. There was a VS bug that prevented the code template functionality from working correctly in some cases. If nothing is created and you see errors in the output window, please upgrade VS to 15.6. If you don't want to upgrade, setting Enable Project Caching to No in Tools|Options|Projects and Solutions|VC++ Project Settings also works around this bug. The blueprint property visualizer was previously released as its own VS extension, but was rather unstable. It appears to be significantly more stable on VS2017 than it was previously. It requires some very ugly memory calculations as well as use of an entirely undocumented VS API, so there may still be issues. It can be disabled from the extension's options page.